Increasing developments of grid infrastructure, rising demand for integration of renewable energy sources, improved grid reliability, and efficient outage response have increased the penetration of smart power distribution systems, globally. Adoption of smart power distribution solution by utilities is rising due to the increasing need for savings in capital expenditure (CapEx) and operational expenditure (OpEx). Increasing consumer demand for high speed data networks for reliable connectivity and mobility has fueled the demand for smart power distribution systems solutions. Numerous advancements in the networking industry and various benefits provided by automation technologies are expected to boost the demand for smart power distribution systems solutions. The advanced metering infrastructure segment is expected to hold a major share of the global market, during the forecast period due to the rising adoption of AMI meters in order to increase operational efficiencies and customer service. Furthermore, a large number of utilities are rapidly installing AMI meters in order to generate more accurate bills and automatically and wirelessly send actual energy usage to the consumer, which in turn has boosted the advanced metering infrastructure segment across different regions of the world. Consumers are rapidly adopting various smart grid solutions, as smart grid solutions allow electrical appliances to be automatically controlled and also reduce the overall cost of electricity. The software segment is expected to dominate during the forecast period due to the increasing implementation of various advanced automated software in order to manage the rising power consumption, power outages, fault detection, and power theft. Software allows utilities to reduce the overall production costs by eliminating human errors. The software segment is projected to expand at a high CAGR of 14.9% during the forecast period, as several countries across the globe are focusing on developing and refining grid infrastructure, including advanced metering, distribute on automation, substation automation, ubiquitous communications networks, micro grids and DER integration. The industrial segment is expected to expand at a significant CAGR during the forecast period. Factors such as a large number of oil & gas industries and continuous technological advancements are boosting the industrial segment. 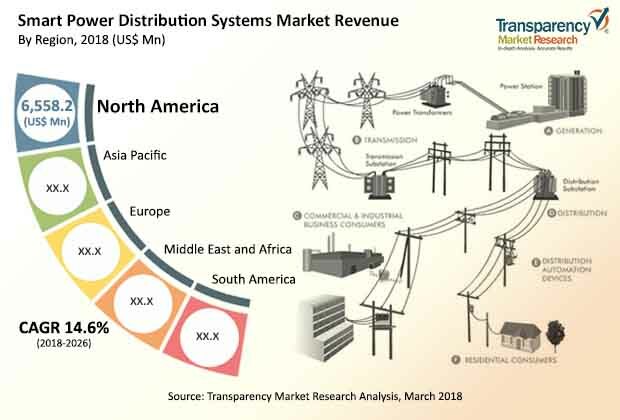 In terms of revenue, North America held a major share of the global market in 2017 due to numerous technological advancements and presence of a large number of grid automation solution providers in the region. Power grid solutions and services providers in North America are collaborating with each other and focusing on offering various advanced technology solutions to the consumers owing to the rise in the usage of power in the region. In North America, a large number of utilities are increasingly investing in smart grid technologies in order to improve operational efficiency and customer service. In 2016, investor-owned electric companies in the U.S. invested about US$ 53 Bn in the energy grid, US$ 21 Bn in the transmission grid, and US$ 32 Bn in the distribution grid. Furthermore, the presence of smart grid solutions giants and various technological advancements are helping the market in North America to generate significant revenues. The U.S. held a prominent share of the market in the region in 2017. The market in North America is estimated to expand at a prominent CAGR during the forecast period. In February 2017, the U.S. proposed grid infrastructure investment up to US$ 1 trillion in order to improve the power distribution infrastructure and customer interaction such as home energy management systems and regular online interaction with their energy data. The market in North America is estimated to expand at a significant CAGR of 15.2% during the forecast period. In Europe, several utilities are collaborating with smart grid providers in order to deliver efficient, reliable, and affordable energy to consumers. The market in Europe is likely to expand at a significant CAGR during the forecast period. The U.K. accounted for a major share of the smart power distribution systems market in Europe in 2017. In the U.K., smart meters are being deployed across a wide range of industries. Demand for smart power distribution solutions in APAC is likely to remain concentrated in China and India, owing to a larger consumer base in these countries. The market in India is estimated to expand at a significant CAGR among the countries in Asia Pacific during the forecast period owing to the rising need to improve the grid infrastructure and reduce power outages. A majority of countries in APAC are still using traditional power distribution systems, which are expected to shift toward smart grid solutions. In Middle East & Africa (MEA), market players are increasing their investments in order to expand their physical presence. The market in the countries of the GCC is expected to expand at a significant CAGR during the forecast period owing to the increasing adoption of automation technologies and rising investment in smart city projects. Increasing IT spending and grid infrastructure development in South America, especially in Brazil are driving the regional smart power distribution systems market in the region. In terms of revenue, Brazil is expected to hold the significant share of the market in the region during the forecast period. The company profiling of key players profiled in the global smart power distribution systems market includes company overview, major business strategies adopted, SWOT analysis, and market revenues for the years 2016 to 2018. The key players profiled in the global smart power distribution systems market include Cisco Systems Inc., General Electric Company, ABB Ltd., Siemens AG, Schneider Electric SE, Landis+Gyr AG, Itron Inc., Oracle Corporation, Eaton Corporation, Aclara Technologies LLC. Various players are establishing partnerships to provide various smart grid solutions on a large scale in order to reduce power outages across the world. The Smart Power Distribution Systems Market – Global Industry Analysis, Size, Share, Growth, Trends, and Forecast, 2018 – 2026, report provides analysis of the smart power distribution systems market for the period 2016 to 2026, wherein the period from 2018 to 2026 is the forecast period, and 2017 is considered as the base year. Data for 2016 has been included as historical information. The report covers all the trends and technologies playing a major role in the expansion of the smart power distribution systems market during the forecast period. It highlights the drivers, restraints, and opportunities expected to influence the expansion of the market during this period. The study provides a holistic perspective on the expansion of the market, in terms of revenue (in US$ Mn), across different geographical regions, namely, North America, Europe, Asia Pacific, Middle East & Africa, and South America. The report highlights the key trends affecting the market on a global scale. Furthermore, region-wise prominent countries/regions covered in the report include - the U.S, Canada, Germany, France, the U.K., India, China, Japan, GCC, South Africa, and Brazil. This report analyzes and forecasts the market for smart power distribution systems at the global and regional level. The market has been forecast based on revenue (US$ Mn) from 2018 to 2026. The study includes drivers and restraints of the global smart power distribution systems market. It also covers the impact of these drivers and restraints for smart power distribution systems market during the forecast period. The report comprises a detailed value chain analysis, which provides a comprehensive view of the global smart power distribution systems market. The Porter’s Five Forces model for the smart power distribution systems market has also been included to help understand the competitive landscape in the market. The study encompasses market attractiveness analysis, where in end-users are benchmarked based on their market size, growth rate, and general attractiveness. The report segments the market based on component, application, and region. The component segment includes software, hardware, and services. The software segment is further segmented into advanced metering infrastructure, smart grid communication, smart grid distribution and management, substation automation, billing information system, and others. The hardware segment is further segmented into sensors, AMI meters, programmable logic controller (PLC), protection and control relays, and others. The services segment is further segmented into deployment and integration, consultant, and maintenance. The application segment includes industrial, commercial, and residential. Cisco Systems Inc., General Electric Company, ABB Ltd., Siemens AG, Schneider Electric SE, Landis+Gyr AG, Itron Inc., Oracle Corporation, Eaton Corporation, Aclara Technologies LLC are some of the major players operating in the smart power distribution systems market profiled in this study. Details such as financials, SWOT analysis, business strategies, recent developments, and other such strategic information pertaining to these players have been duly provided as part of company profiling. Various players are rapidly introducing smart power distribution solutions that allow utilities to improve the grid infrastructure and meet the rising demands for efficient power distribution system. Moreover, various players are establishing partnerships to provide various smart grid solutions on a large scale in order to reduce power outages across the world.